SUCH was the effort and emotion expended pre-match, there was every reason to suspect Celtic had succeeded only in blowing themselves out by the time it came to the matter of competing in a football match. Two goals down after a dozen minutes, it really did seem that the nostalgia surrounding this fixture had enervated the home side, who were wrestling with the ghosts of the past as well as the sturdy athletes who made up their distinguished opponents. But inspired, perhaps, by the promptings of the often derided Green Brigade section, some new stars, including Stuart Armstrong and John Guidetti, appeared on a night that was always going to be set in the context of a storied past. There might have been a cliffhanging ‘whodunnit’ unfolding in a soap opera on television, but the real tension was in another city’s east end and involved a more literal meaning of the word unfolding. What message, we wondered, had the Green Brigade decided to impart on their banners? Reports circulated before the game that this sometimes anarchic group of supporters had prepared something particularly special. Knowing Uefa’s dislike for any sort of political point-scoring, Parkhead chief executive Peter Lawwell will have felt particularly on edge as he watched several banners being stretched out in the far corner of the stadium. Relief must have flooded through him when he realised there was no reason for alarm; the fans had indeed succeeded in creating a display fit for the occasion. It was, of course, based on the legend of Lisbon. But, crucially, it also urged the current crop of players to try and move out of the shadow of their antecedents. ‘It is up to us. To everyone at Celtic Park. To build our own legends.’ Below these motivational words was a huge television – someone pointed out it looked more like a microwave – that somehow changed from showing an image of Celtic’s first goal in 1967 to one depicting their winning strike that evening. Of course, it made for some easy gags when Celtic suffered the kind of start that threatened to make a mockery of such portentous words. Can someone turn the channel over? Maybe that EastEnders murder-plot-thingy is worth tuning into after all? Coincidentally, after the EastEnders special something called Death in Paradise was scheduled on BBC 1. Nearly 60,000 were contemplating the snuffing out of a dream in a stadium that had, not long before Inter’s quick-fire opening salvo of goals, seemed fired by hope. For 40 or so minutes before kick-off, anything and everything seemed entirely possible. Stoked up by the lovable Bertie Auld’s infectious call to arms, Celtic Park has rarely looked or sounded better. Indeed, perhaps the intoxicating theatre succeeded only in cowing the home players, many of whom have not experienced anything like it. Those such as Gary Mackay-Steven, Stuart Armstrong and Leigh Griffiths were playing their first high-octane European game at Celtic Park. Auld, however, is a veteran of such nights. He was brought on to whip the fans up further after particularly rousing renditions of Nessun Dorma and You’ll Never Walk Alone by John Craig Innes, aka “The People’s Tenor”. The singer managed to stay on the right side of sentimentality with both performances, even if the first song choice might have been considered slightly naff. As for the second, one feared Celtic had gone too early with their powerful signature song. 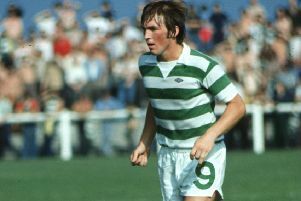 But no-one needed to worry on that front; the repeat performance, by a choir of nearly 60,000, was as stunning as expected; the Inter players, who by this stage were waiting patiently for kick-off, pretended not to notice the fact they were in the midst of a sea of green and white scarves. The visitors otherwise seemed to appreciate the efforts of the hosts to achieve the delicate balancing act of making them feel welcome while at the same time rubbing their nose in constant references to 1967. And, to be fair, the programme did include an article chronicling Inter’s revenge at the semi-final stage of the same competition in 1972, along with the inevitable forensic scrutiny of events in Lisbon five years earlier. But it was a nice touch to have two members of the Inter Milan team beaten in Lisbon involved in the guard of honour at the start, along with the surviving members of the Celtic side, including the irrepressible Auld. The energetic Auld had already grabbed the microphone from the announcer and challenged the fans to show they are the best singers in the world. He wasn’t let down on that count as the home fans responded to the stunning comeback from Celtic. A composed finish from Armstrong brought his side back into the game and then the pressure he put the Italian side’s left-back, Hugo Campagnaro, under saw Celtic draw level. Somewhere in the stadium, Auld was probably doing cartwheels. Even though Inter edged in front again in what, from the Celtic goalkeeper Craig Gordon’s point of view, was an infuriatingly cheap manner, there was much to commend on a night which ended so joyfully courtesy of Guidetti’s late intervention. Those early reports of a death in Paradise were greatly exaggerated. Despite their initial stumble, Celtic just about managed to walk in the footsteps of legends.